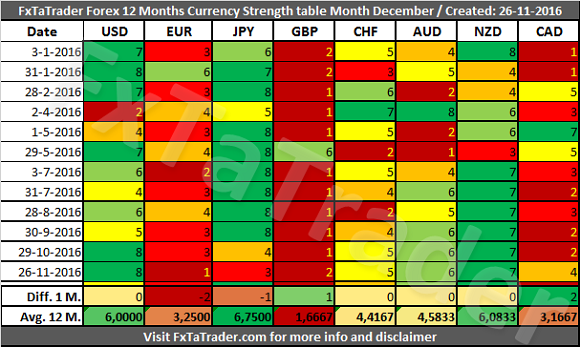 In the Currency Strength table the USD was again the strongest currency while the EUR was the weakest. The AUD and NZD remain firm having for a long period a similar score. The NZD has now for 6 months a Score of 7 and the AUD 4 times a Score of 6 and 2 times near that Score. Although the GBP gained a lot of strength in the last Weeks it only gained 1 point last month. The JPY lost strength for a second month but it is still the strongest currency when looking at the Avg. 12 months. For more details read both of my articles where the relevant Charts and Tables are provided. All the currencies are within their classification when using the Avg. 12 M. Although the JPY is in a dip this month this does not have any effect on the Avg. 12 months Currency Score. The JPY remains the strongest currency. In the last 2 Months the JPY is in a dip with a score of 3 being the weakest one of the strong currencies. 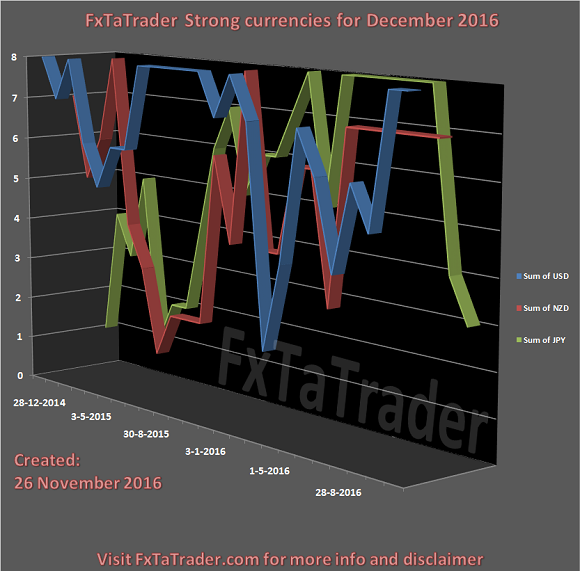 However, it is clear to see that this currency was in the last period very strong, the strongest of all for almost the whole year. For that reason it does not seem that this currency will continue to weaken. There will be at least a period of consolidation before the currency will get close to a Neutral classification. It has at the moment the highest Avg. 12 M. Currency Score of all currencies! As can be seen here below the USD and NZD had similar dips and recovered. The NZD is very stable lately while the USD gained strength and is back to the area of the Strong currencies. 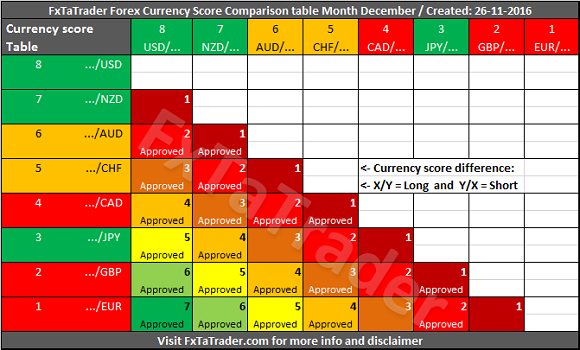 Here below you can see the Monthly Currency Score Chart with 24 months data as a reference. First of all only better classified currencies in combination with weaker classified currencies are "Approved" when there is a Currency Score difference of at least 1 in the current month. It means that each currency should be as far apart from each other as possible in the range from 1 to 8. The classification of the currencies in question may change in the longer term. By using the difference of 4 which is exact the half of the range it seems a safe approach for trading 2 currencies which are similarly classified. Besides this article I also use the Forex "Ranking, Rating and Score" which is also available once a month on my blog. In the article "Ranking, Rating and Score" we look in more detail at the absolute position of the currencies and pairs. It is recommended to read the page Currency score explained and Models in practice for a better understanding of the article. If you would like to use this article then mention the source by providing the URL FxTaTrader.com or the direct link to this article. Good luck in the coming month.